Discussion in 'Cannabis News and Activism' started by vtac, Jun 26, 2008. Wait! Hold on a second here. Are you guys saying that LEOs would dust cannabis with fentanyl in an effort to scare the general population about cannabis and try yet again to equate this miraculous & mysterious plant with hard narcotics like heroin & cocaine?! Because it seems like that’s what you guys are saying and I, for one, am shocked and appalled at the implication that some local, state & federal LEOs view legal herb as a lost source of personal income and recurring revenue for their respective organisations and would act outside the law to the detriment of the population they’ve sworn to protect and serve. The very notion this could ever happen is outrageous! HighMtnSkier, macbill, BigJr48 and 1 other person like this. Booze and weed beginning of the end or something interesting. pxl_jockey, macbill, BigJr48 and 3 others like this. macbill, BigJr48 and Ramahs like this. C No Ego, BigJr48, mitchgo61 and 3 others like this. Helpful to know if you are in a legal place. His_Highness, BigJr48 and macbill like this. And if not, just cross your fingers that you don't wake up wile "opened" up. I imagine it would not be the most comfortable experience to have. Summer, macbill, His_Highness and 1 other person like this. Having recently gone through some surgery it was interesting to see the addition of cannabis on the medical forms alongside alcohol and tobacco use. It was liberating to be able to discuss its use with medical professionals without the stigma usually associated with it. Sick Vape, cybrguy, macbill and 2 others like this. When discussing cannabis use with our primary neurologist recently he asked what the cannabis prescription was and I said "low dose" but that's not what is used because full-spectrum is what is required to deal with the pain and nausea. Realizing I was talking about the black market.....He then put his hands over his ears, smiling, acting like he couldn't hear us and closed the file. Then he said "The guidelines have loosened up. Lets get you the correct prescription. Here's a referral to another neurologist who will take you seriously and get you prescribed correctly." Our primary neuro said he has done all the homework, taken the all the steps to qualify to prescribe cannabis but until it's federally legal he's going to have to protect his license and practice and steer clear which is why he has to refer us to someone else. Whisper, justcametomind, Bdubbdiblets and 5 others like this. Summer, OldNewbie, Ramahs and 1 other person like this. Yup. Now I’m going to have to try that game tonight. justcametomind, His_Highness and macbill like this. I wonder what the hook is. There have been drug dealing games since Drugwars and you could play them even before a 386. I guess it is the grow portion. Something like one of the farming simulator games. Summer, His_Highness, Ramahs and 1 other person like this. Summer, pxl_jockey, C No Ego and 5 others like this. Canadian marijuana grower Canopy Growth announced Thursday a $3.4 billion deal to acquire Acreage Holdings that will take effect after cannabis has been legalized in the U.S. The deal, which was finalized Thursday morning in New York, grants Canopy the right to buy all of Acreage’s stock following nationwide legalization; the two companies will operate independently until then. It will also grant Acreage access to Canopy vault of brands including Tweed. cybrguy, BigJr48, hans solo and 3 others like this. 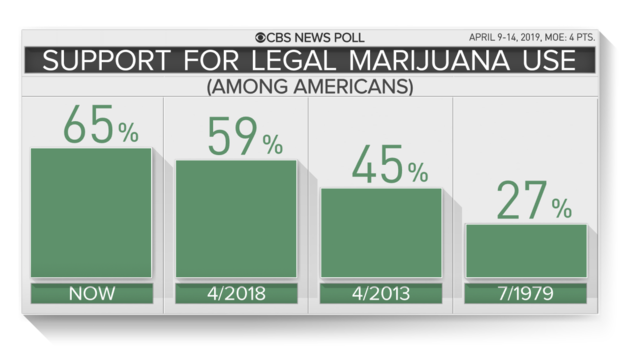 Sixty-five percent of Americans now think marijuana should be legal — a record high in CBS News polling. Most view marijuana as less harmful than alcohol and believe it is less dangerous than other drugs. Many opponents of legalization, however, think it leads to a rise in crime and most favor the federal government taking action to stop the sale of pot in states where it is currently legal. BigJr48, Summer, C No Ego and 1 other person like this. I guess that means it is not going to be free for all people then ?????? Ramahs, BigJr48 and macbill like this. Ramahs, BigJr48, macbill and 1 other person like this. Ramahs, BigJr48, His_Highness and 2 others like this. If they want to ensure participation by communities of color, they need to block moves like this one. ALL moves like this one. I’ll bet they’ve already closed a deal with Phylos for one of their “limited” “breeder partnerships. their ‘searching’ questions did not include “what happens if Big Money decides to control weed and weed legislation, or how do we make sure community participation *real* and not just another round of token figureheads. His_Highness, macbill, C No Ego and 2 others like this. New guidance from the U.S. Citizenship and Immigration Services (USCIS) — which issues green cards and citizenship — says immigrants involved in "marijuana-related activities" could be found to lack good moral character, which is required to gain citizenship. "Activities" include the possession, manufacturing, distribution or dispensing of cannabis, regardless of state laws. BigJr48, Ramahs and His_Highness like this. BigJr48, C No Ego, His_Highness and 2 others like this. It's not revoking it, it's not giving it. Weed is still federally illegal so they can't extend citizenship to anyone working in an illegal industry. Has nothing to do with political party affiliation. Makes logical sense to me. They’ve actually begun revoking citizenships, very sad to say. macbill, His_Highness and Summer like this. Global cannabis suppliers struggled to keep up with demand on Saturday, the biggest ever 4/20 Day, an annual celebration of marijuana on 20 April, which in the US calendar is referred to as 4/20. Summer, Whisper, OldNewbie and 3 others like this. Petitioner, of Polish birth, became a naturalized American citizen in 1926. He went to Israel in 1950, and in 1951 voted in an Israeli legislative election. The State Department subsequently refused to renew his passport, maintaining that petitioner had lost his citizenship by virtue of § 401(e) of the Nationality Act of 1940 which provides that a United States citizen shall "lose" his citizenship if he votes in a foreign political election. Petitioner then brought this declaratory judgment action alleging the unconstitutionality of § 401(e). On the basis of Perez v. Brownell, 356 U. S. 44, the District Court and Court of Appeals held that Congress, under its implied power to regulate foreign affairs, can strip an American citizen of his citizenship. Held: Congress has no power under the Constitution to divest a person of his United States citizenship absent his voluntary renunciation thereof. Perez v. Brownell, supra, overruled. Pp. 387 U. S. 256-268. (a) Congress has no express power under the Constitution to strip a person of citizenship, and no such power can be sustained as an implied attribute of sovereignty, as was recognized by Congress before the passage of the Fourteenth Amendment, and a mature and well considered dictum in Osborn v. Bank of the United States, 9 Wheat. 738, 22 U. S. 827, is to the same effect. Pp. 387 U. S. 257-261. Whisper, macbill, BigJr48 and 1 other person like this. shredder, Summer, justcametomind and 3 others like this.